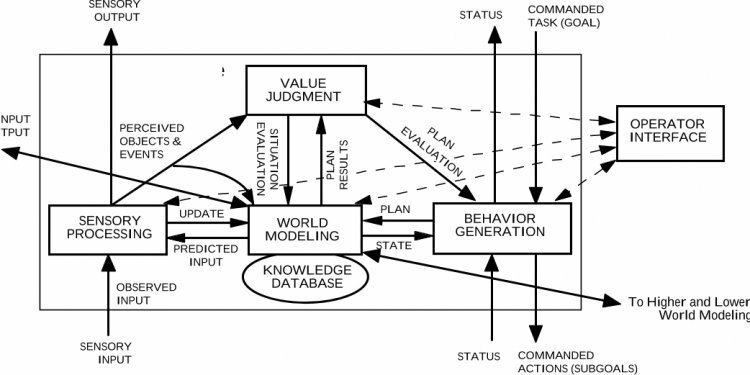 To keep exposition reasonably straightforward, we focus on the two-level control architecture shown in the figure on the right. Low-level control is implemented by an intermediate layer communicating with the plant via low-level (physical) signals L and L and with the high-level supervisor via high-level (abstract) signals H and H. Apart from implementing low-level control mechanisms corresponding to high-level commands H, the intermediate layer aggregates low-level measurement information L to provide high-level information H to the high-level supervisor. Aggregation may be both in signal space and in time, i.e., the time axis for high-level signals may be "coarser" than for low-level signals. We denote the behaviours of low-level plant model, intermediate layer and high-level control by , , and , respectively. Note that in this scenario and are behaviours on L and H, while is a behaviour on , where and represent the high and low-level signal sets. The control synthesis task then is to come up with a two-level controller such that (i) the overall controller restricts the plant behaviour to a given specification behaviour , (ii) the overall controller is admissible to the plant model, (iii) the high-level controller is admissible to , i.e., the plant under low-level control. In this context, admissibility of a controller means the following: the controller respects the plant's input/output structure, and any trajectory that plant and controller have "agreed on" in the past can be extended into the future. In and, we have discussed which properties of plant model and control layers will guarantee that admissibility conditions (ii) and (iii) hold. In particular, we have shown that very weak requirements on plant model and high-level supervisor will suffice for any combination of the intermediate layers shown in the figure below. Intermediate layers implementing switching between low-level controllers. Intermediate layers implementing measurement aggregation in time and signal space. In fact, these types of intermediate layers are precisely the ones that are needed in most application problems. In, we have also proposed a bottom-up design procedure for and : in a first step, the intended relation between high-level and low-level signals is formalised by a specification . Clearly, it is in this step where engineering intuition is "embedded" into our formal framework. In a second step, using standard control synthesis methods, we need to design the intermediate layer such that the specification holds. In a third step, synthesis of high-level control is addressed. It can be based on a suitable abstraction of , i.e. the plant model under low-level control, and a suitable translation of into high-level specifications. In particular, we propose to use the high-level projection of as an abstraction of the plant model under low-level control. If both synthesis steps succeed, we can guarantee that the resulting overall controller indeed enforces the original specifications for the underlying plant model . In, we have also discussed how the remaining degrees of freedom can be used to address performance optimisation issues. The potential of our approach has been demonstrated by applying it to a multiproduct batch control problem, where the specification is to produce the desired product volumes with minimal cost subject to quality and safety constraints . We are currently mostly interested in the implications of tightening/relaxing subsystem specifications, in characterising achievable performance for specific control architectures, and in demonstrating the potential of the suggested approach by applying it to specific applications. For the latter purpose, a hybrid chemical engineering benchmark for hierarchical control has been proposed by the Fachgebiet Dynamik und Betrieb technischer Anlagen (G. Wozny, H. Arellano-Garcia) at TU Berlin and our group.